I prefer my petrol shaken, not stirred. 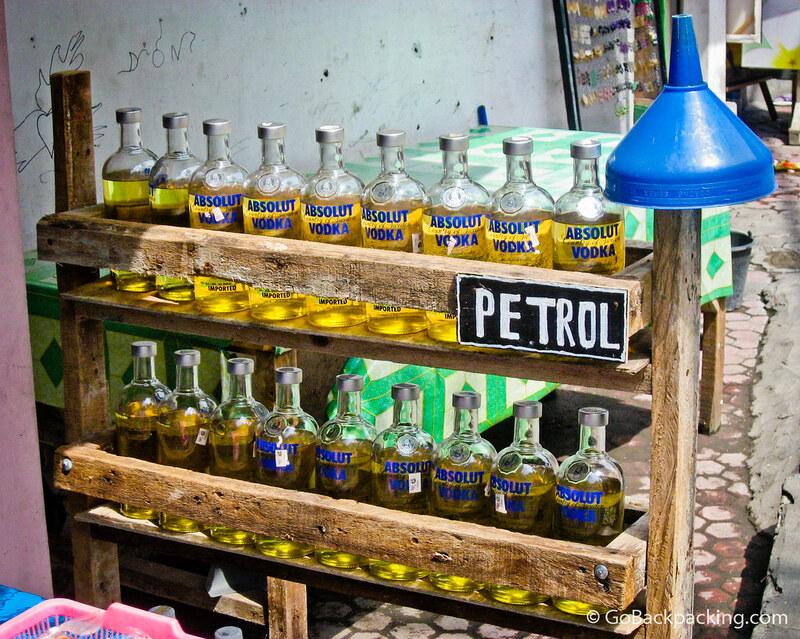 At first glance, these Absolut Vodka bottles appear to be filled with urine, but in fact, they're used to sell gasoline in Bali, Indonesia. Love this! When I was in Bali I remember seeing gasoline jugs everywhere but I didn’t see this creative recycling technique! Although the pic looks great, I can’t imagine why would anyone buy petrol in a bottle. Mia, basically it’s a pre-measured liter of gasoline. It’s more common to see this in developing nations, especially when they have a lot of motorbikes. In the USA, you might buy an amount like this to take home and power your lawnmower, but we usually use specially designed plastic containers that hold more (measured in gallons).